I fell in love with Fleur de Sel, the rare hand-raked salt, years ago. I’ve got high blood pressure, and unfortunately, I need to limit my intake of salt. So my discovery of “finishing salts” allowed me to cook completely without salt until the very end, where I can then sprinkle just a few crystals of this moist, hand-harvested miracle on my plate, enjoying every tiny burst of salty ocean flavor without a lot of guilt. 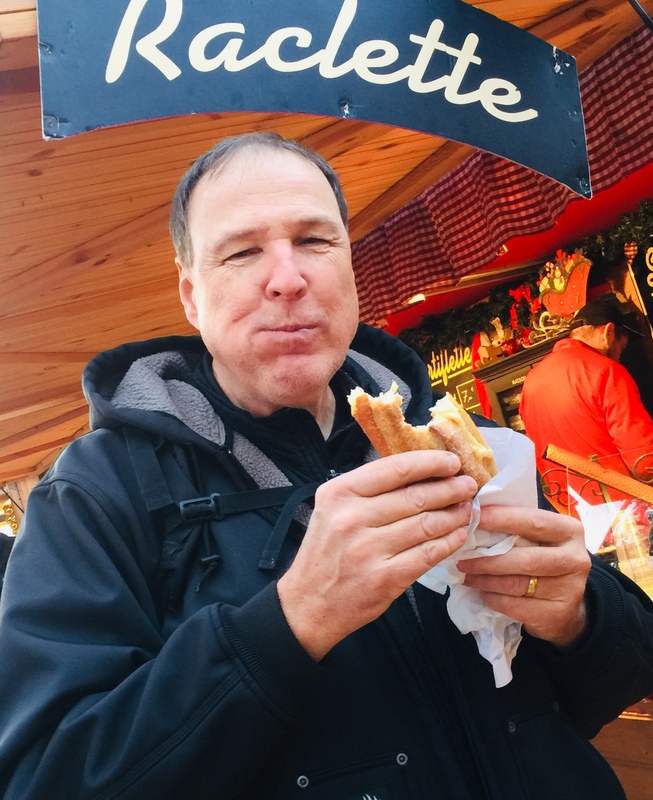 Inspired by an episode of “No Reservations” where Anthony Bourdain journeyed to Brittany, my wife and I dreamed of traveling to what is arguably the epicenter of Fleur de Sel production, the small town of Guerande, France. 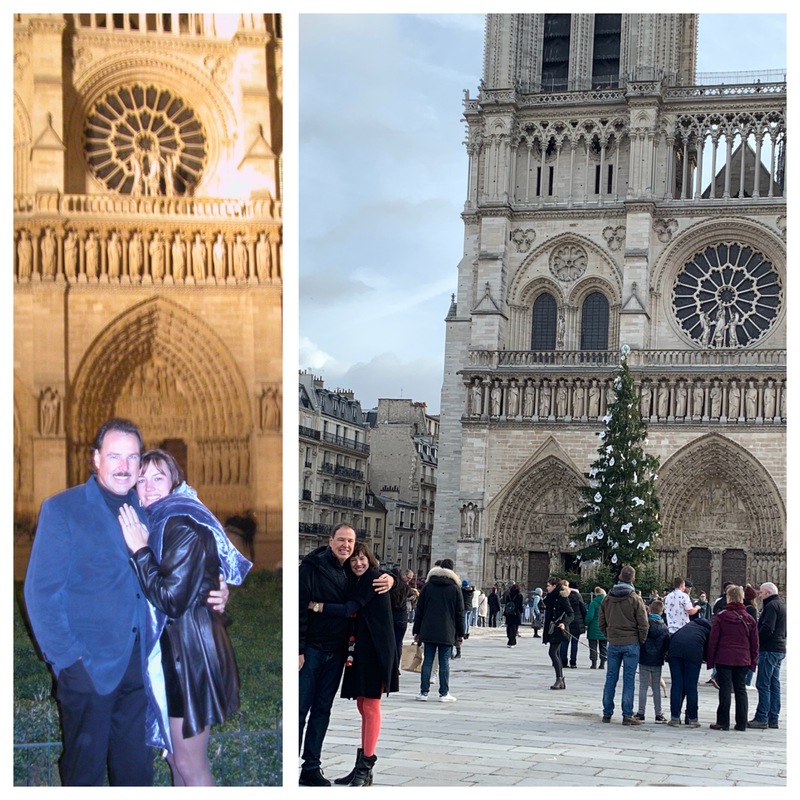 Located on the Atlantic coast in the Pays de La Loire region just south of Brittany, it’s about a 5-hour drive from Charles de Gaulle airport outside of Paris. Some of the articles we read about the medieval town of Guerande said it was too touristy, but we found that it had a lot of charm: the perfect combination of old and new, with many interesting shops and eateries inside its ancient walls. Built in the 15th century and fortified in the 19th century, the surrounding wall around Guerande is one of the best preserved in all of France. The salt marshes outside the city walls have been around a long time…the last of them built around 1800. Salt production here declined soon after, because salt was available more cheaply from salt mines. But you gotta love foodies…the influence of chefs and food lovers around the world have brought back the demand for this very special product. Salt workers now harvest about 15,000 tons of cooking salt a year, and about 300 tons of the very precious Fleur de Sel. 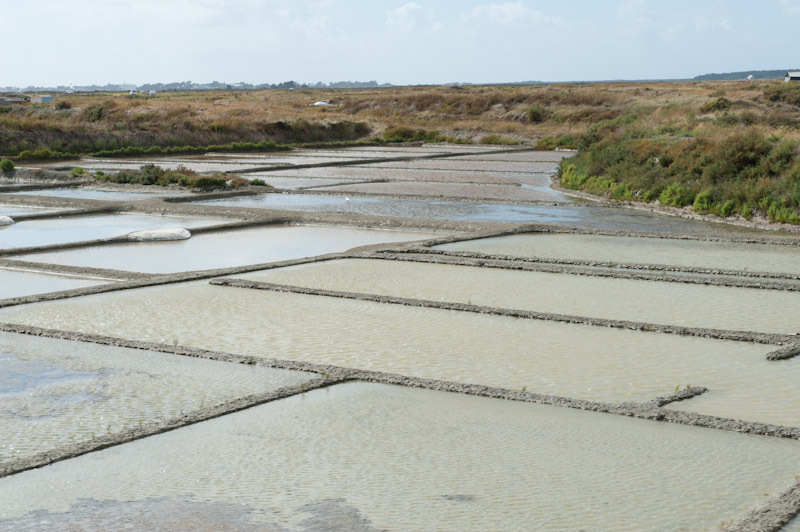 The process is simple: the ocean tides bring the salt water in and channel it into shallow pools where the water then evaporates, leaving behind the beautiful sea salt Guerande is known for. When just a few inches of water remain, a salty crystalized film floats on the surface of the water. This is very gently hand-raked and produces the much sought after Fleur de Sel. Traditionally only women were allowed to rake this salt because it was believed they had a gentler touch. Driving through the salt field was a wonderful experience. The roads are narrow, and wind almost endlessly through these flat marshes where salt workers spend their days raking, gathering and then bagging their precious harvest. You can stop anywhere along the way to buy your salt directly from these salt workers, which we did. It was easy to get carried away…we brought home over 20 lbs. of salt! Of course, we shared it with friends. 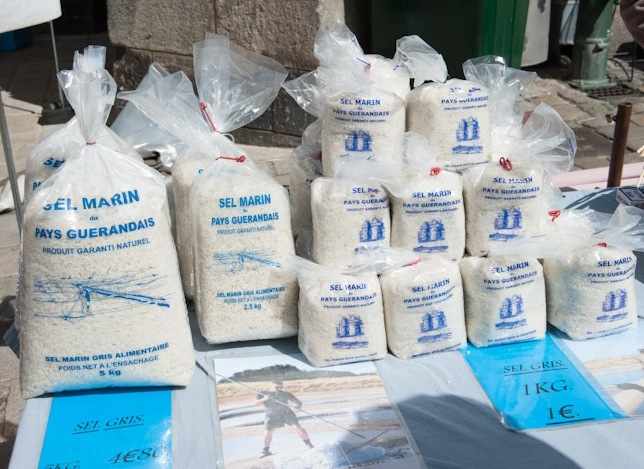 Harvesting and selling salt in Guerande is a family affair. One taste of Fleur de Sel, letting it gently melt on your tongue, and you’ll know what the big fuss is all about. Our Fleur de Sel journey did not end in Guerande, however. After a couple of nights in that region, we headed south to the island of Ile de Re, just off the coast of La Rochelle, France. Connected by a 3km bridge, Ile de Re is a beautiful world unto itself, with an intricate network of bicycle paths that allow you to travel safely from one end of this flat island to the other, enjoying beautiful views as you ride through vineyards, salt marshes, beaches and small port towns. As in Guerande, not only can you sample the local salt, but also the abundant supply of incredibly fresh seafood, especially their famous oysters. 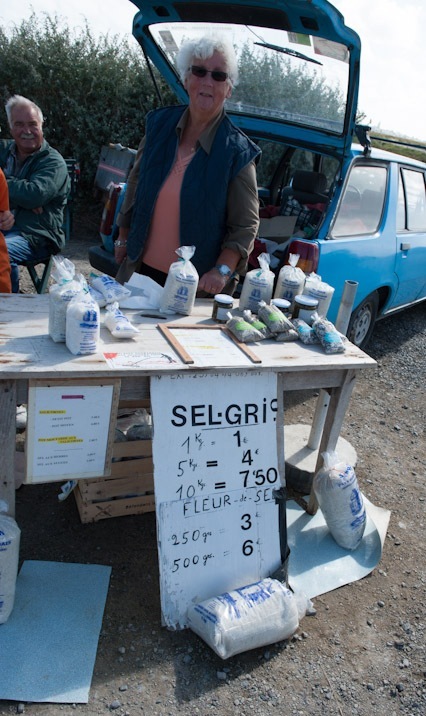 The salt flats seem somewhat newer in Ile de Re, but still very much a large part of the local economy. The salt itself differs in only the most subtle of ways from its Guerande counterpart and I would find it difficult to say which I liked better. 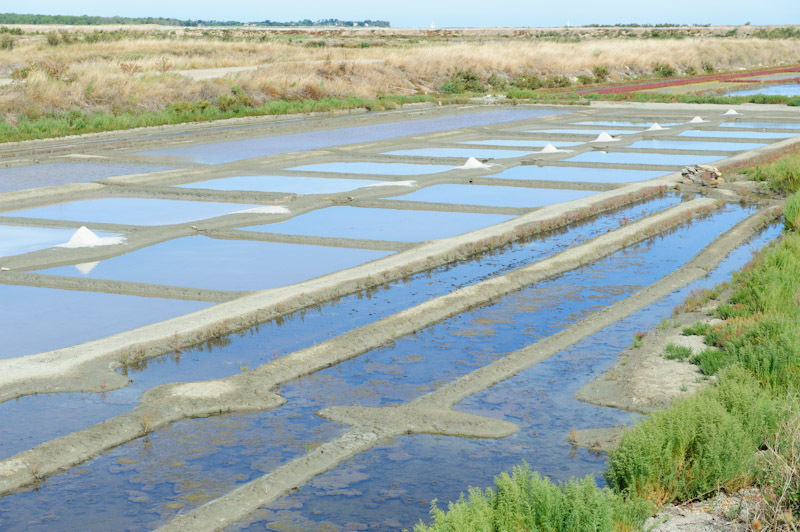 Ile de Re is long and flat, so many of the salt pools are larger than those in Guerande. It may seem a bit silly to travel all this way for something is simple as salt. But it’s a journey I’m very happy I made…and will gladly make again. I fell in love with Fleur de Sel, the rare hand-raked salt, several years ago. I’ve got high blood pressure, and unfortunately, I need to limit my intake of salt. So my discovery of “finishing salts” allows me to cook completely without salt until the very end, where I can then sprinkle just a few crystals of this moist, hand-harvested miracle on my plate, enjoying every tiny burst of salty ocean flavor without a lot of guilt. Some of the comments we read about the medieval town of Guerande said it was too touristy, but we found that it had a lot of charm: the perfect combination of old and new, with many interesting shops and eateries inside the ancient walls of this small town. Built in the 15th century and fortified in the 19th century, the surrounding wall around Guerande is one of the best preserved in all of France. Driving through the salt field was a wonderful experience. The roads are narrow, and wind almost endlessly through these flat marshes where salt workers spend their days raking, gathering and then bagging their precious harvest. You can stop anywhere along the way to buy your salt directly from these salt workers, which we did. It was easy to get carried away…we brought home over 20 lbs of salt! Of course, we shared it with friends. Otherwise, not only would my blood pressure have gone through the roof, but I’d probably be dealing with kidney stones as well! It may seem a bit silly to travel all this way for something is simple as salt. But it’s a journey I’m very happy I made…and will gladly make again in the near future.